At the age of 70, career robber Forrest Tucker embarks on a string of bank robberies that confound the authorities and enchant the public in The Old Man & the Gun, a beautifully crafted film starring Robert Redford in his final on-screen appearance. 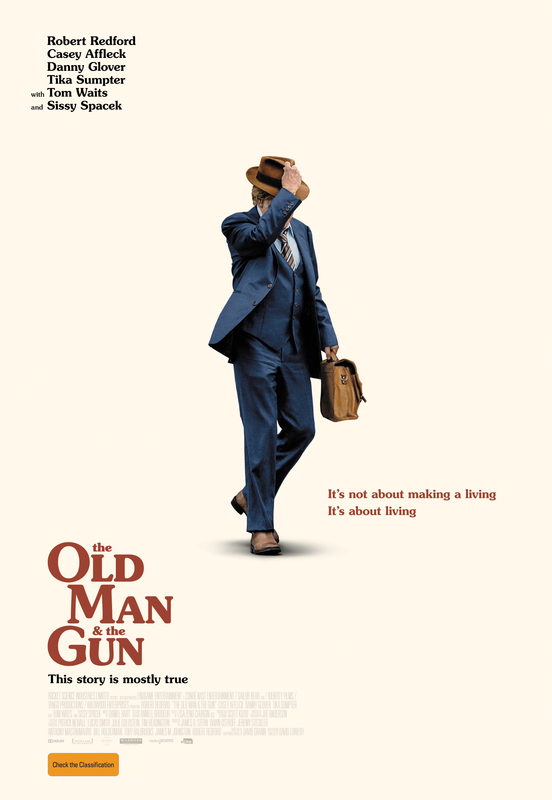 A homage to 1970s American cinema, THE OLD MAN & THE GUN is a charming, beautifully crafted film about what it means to live a life. So goes the production notes for this film, a likeable enough romp across the US as we follow Tucker’s spree of robberies, his relationship with Spacek’s Jewel, and Affleck as Detective John Hunt’s efforts to catch him. Redford plays Forrest Tucker as a long lost friend, calmly robbing banks with a note and a smile, but never violence. Spacek’s Jewel crosses paths with Tucker with her car broken down by the side of the road, and Tucker spots an opportunity to casually use the breakdown as a pitstop to avoid being captured by pursuing police. His pack of thieves, including Tom Waits (as Waller) and Danny Glover (as Teddy) are similarly harmless and this “Over the Hill” gang manage to evade being apprehended due to the small and peaceful nature of their crimes and the fact that they took place before technology could do a large part of the police-work through surveillance cameras and databases. That is until they come to the attention of Hunt who decides capturing these crooks will give his life some purpose. It’s a gentle film, enjoyable enough, a fascinating true story and watching these old school pros on the big screen should provide ample reward for the silver set.